I promised that I’d post the professional photos of the Curly Maple with Ebony rocker and here they are. 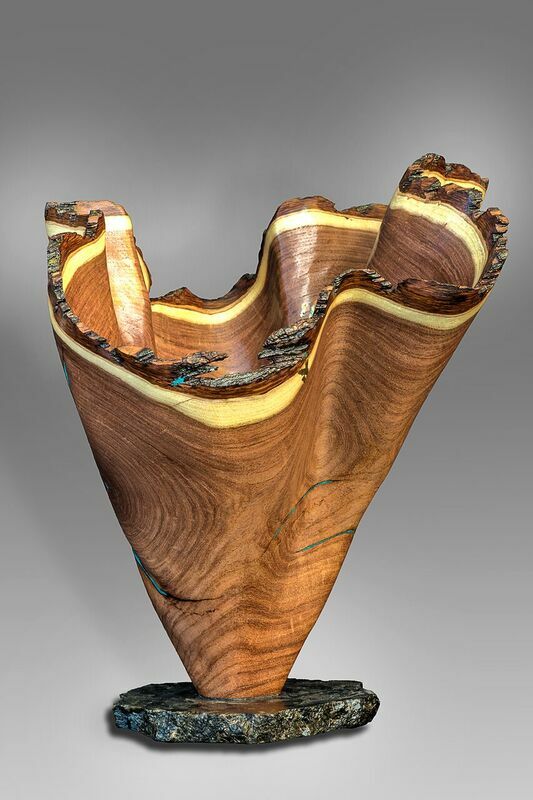 I normally go for the darker woods, but this is just gorgeous and one of our favorites. It just might be a keeper. 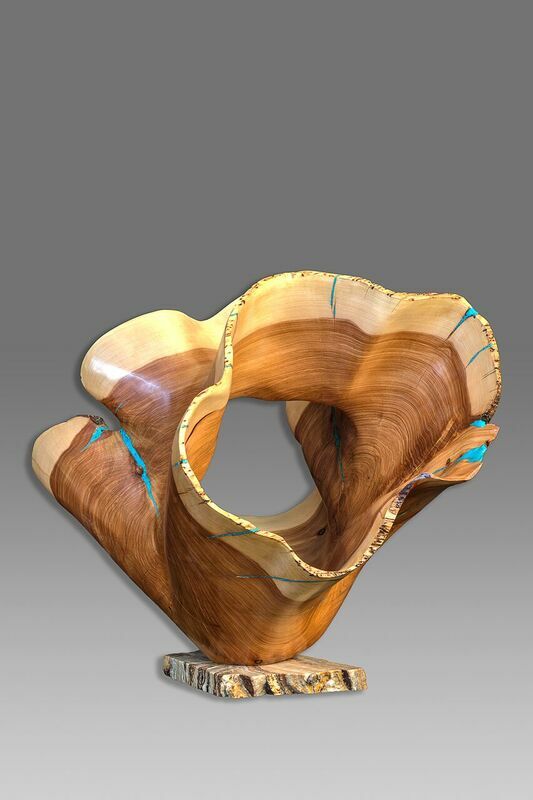 We just found out that we were accepted into the Celebration of Fine Art Scottsdale. This is the original 10 week show, being it’s 23rd year, that takes place Jan-March each year. This show is very hard to get into, so we feel very privileged to be a part of the Celebration family. We will miss some of our new friends that will be at the other show, but we can visit them when we all have time over the 10 week period. 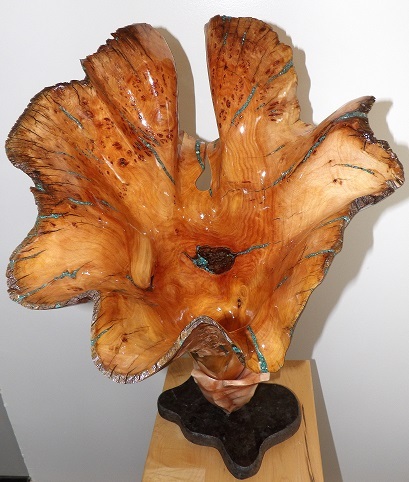 We are looking forward to the show and are already making plans for some spectacular pieces. We will also be having a gallery showing at Mystique Gallery in downtown Scottsdale while we are there and this should be very exciting. 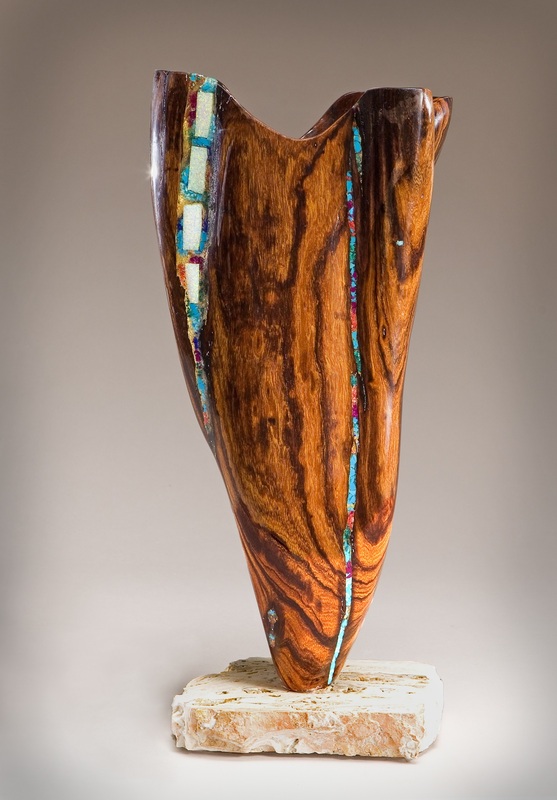 Currently we are gearing up for two upcoming shows in Park City UT and Loveland CO. Scott leaves in two weeks and we’ve been busy creating new sculptures. 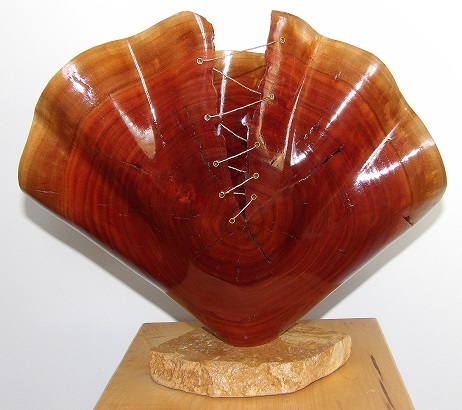 While he is gone, I will post some of these pieces on the blog for all to see. This photo shows how pretty the grain is. 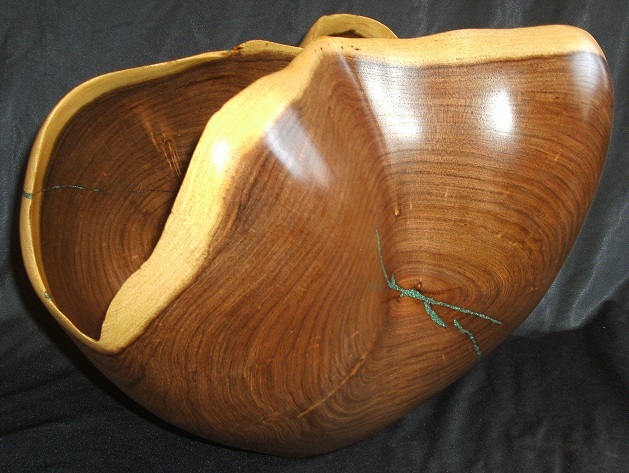 Here you can see the contrast between the black of the Ebony and the light of the Maple. 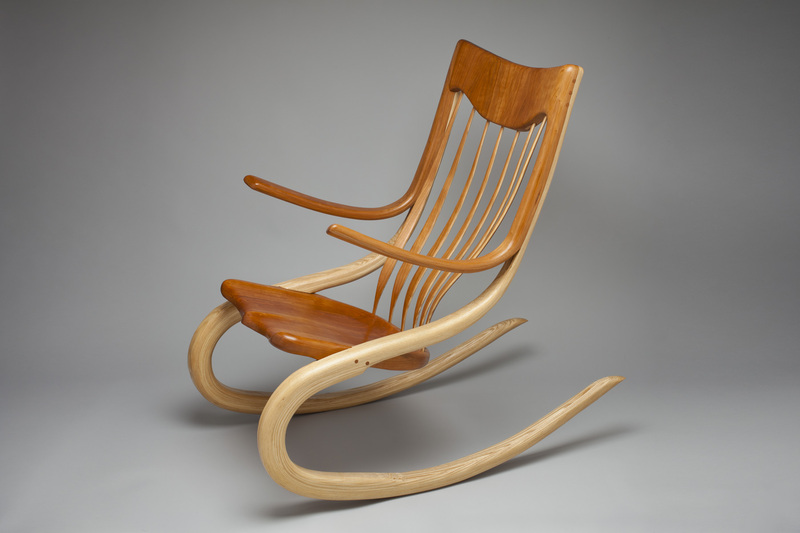 We also had the Bentwood rocker that was made from Cherry and Ash photographed. 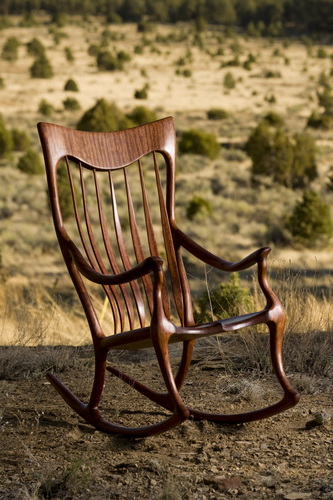 This picture is much better than ours and really shows off this rocker. Since getting back from our three-month adventure in Scottsdale, we’ve been busy doing things around home. That 10 week show really wore us out and it was nice to be home for a while and just relaxing, doing work around here and enjoying our peace and solitude. Scott’s mom came to visit for two weeks and we enjoyed having her here. Sampson’s health is improving. It’s been a slow recover but he’s getting stronger every day. It’s going to be a long process and we have to make sure he doesn’t over do it and go backwards. It’s hard to accept that he’s getting older, but he’s getting better and we hope to have him around for many more years. We also had a new cabin shell delivered. It will eventually join our original cabin with a sunroom connecting them. We have a lot of work to do before that point (wiring, insulate etc). But for now it houses our workout equipment, that has been stored since moving here, a place to put completed pieces, storage and a work area for me to inlay and do finish. It’s nice to have the work space. I’ve been able to work on a few new wall pieces for the upcoming shows (see some of them below). 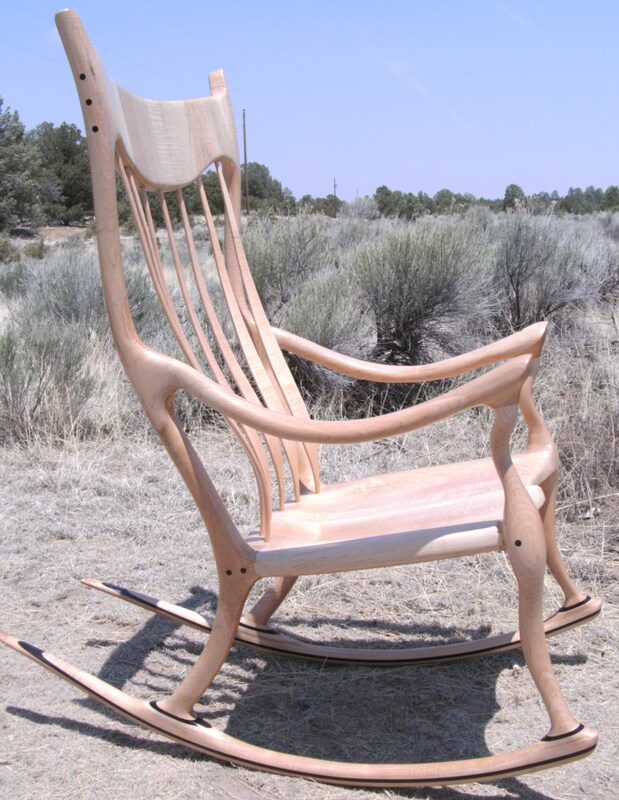 But first we want to show off our newest rocker made from Curly Maple and Ebony. 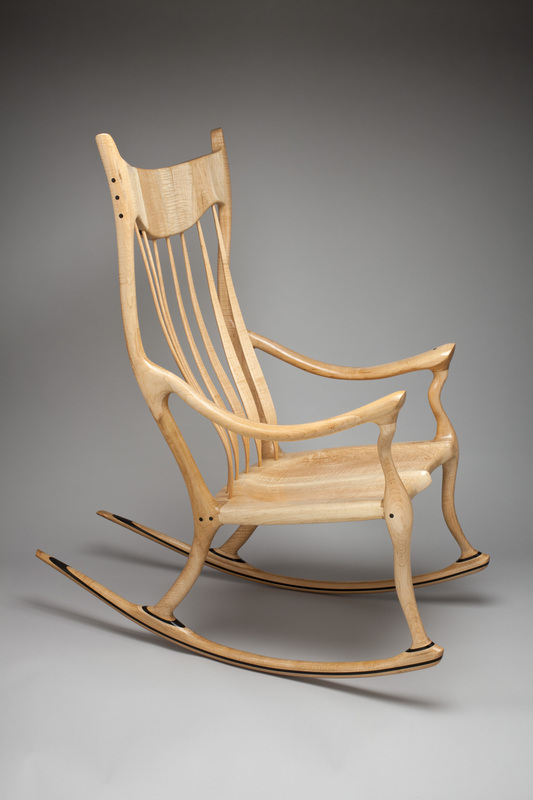 This Curly Maple with Ebony rocker has been on Scotts’ wish list for some time. So finally we made it. 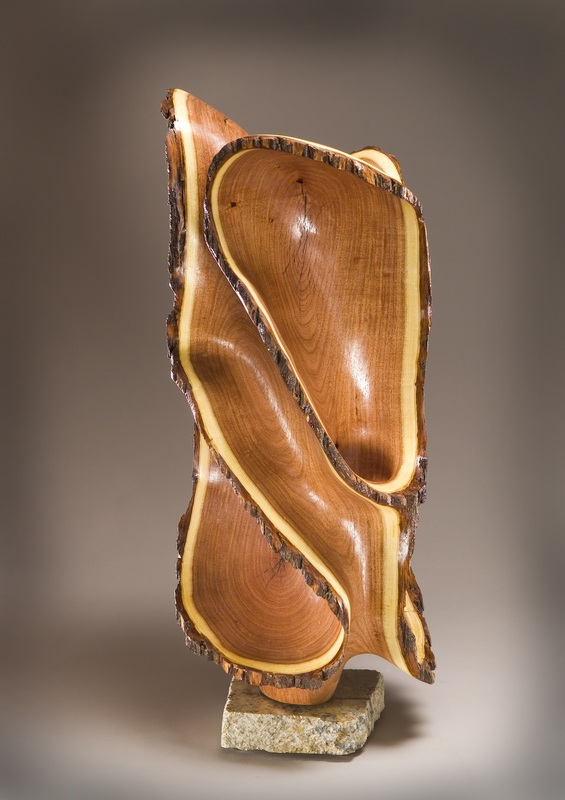 The Curly Maple has some incredible figure in it and Scott did a great job laying out the grain patterns to really show it off. 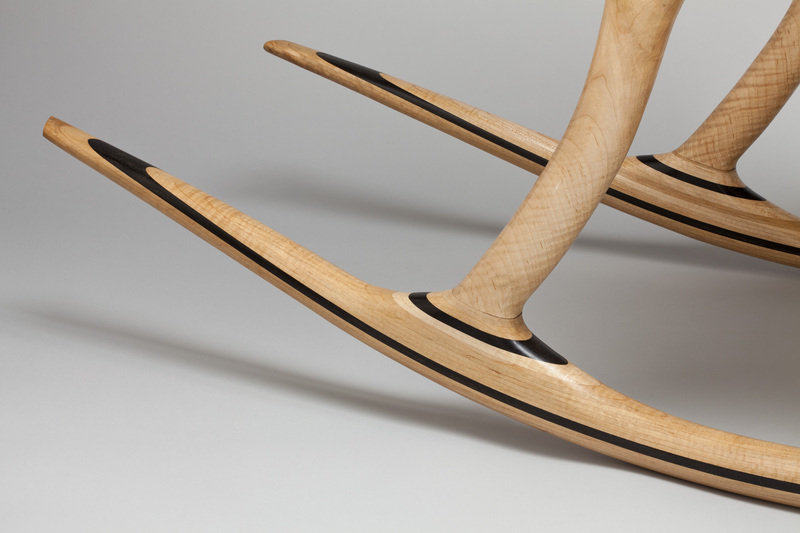 The Ebony was inlayed into the runners, used for plugs and splines on the headrest. 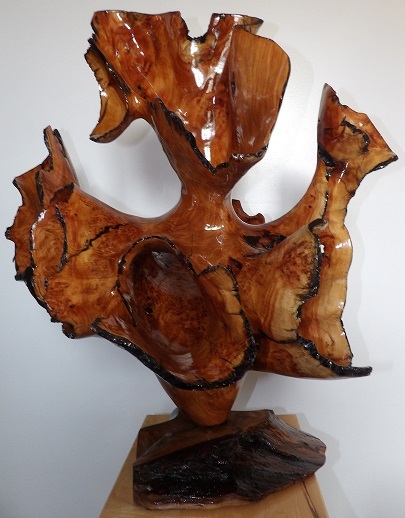 The black is a wonderful contrast to the white of the Curly Maple. 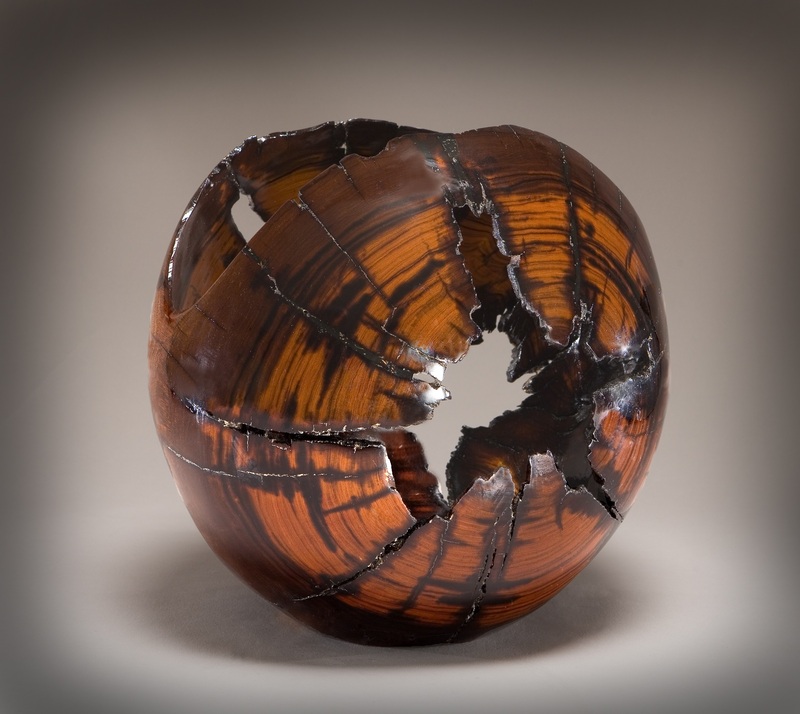 Ebony is an expensive exotic wood and lends itself to being used for accents. I believe this is by far Scotts favorite rocker to date and it might be hard for him to give it up. But I’m sure this rocker is sure to go real fast. We will be having it professionally photographed in a few days and post those when they are ready. They are sure to wow more than our photos. 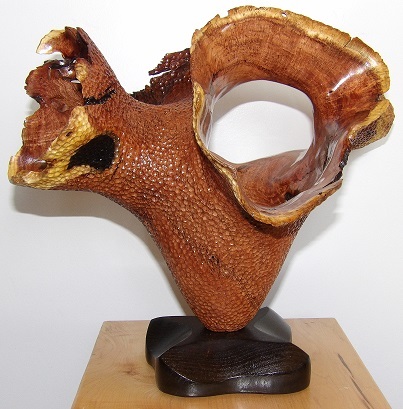 This shot is the best close up we could get to show the curly maple. But it doesn’t really bring out the figure. Hopefully the professional pictures will. 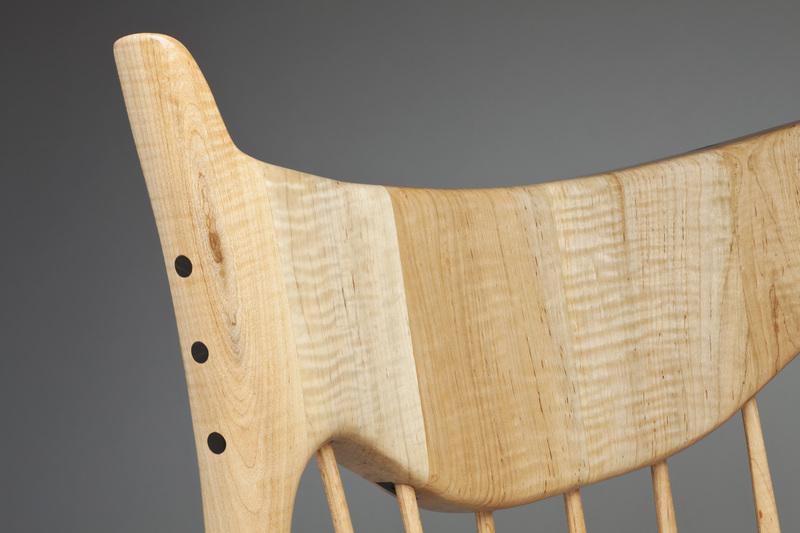 Headrest shows the Ebony splines that run through it. You can see some of the figure here as well. Ebony inlayed into the runners. What a beautiful contrast. 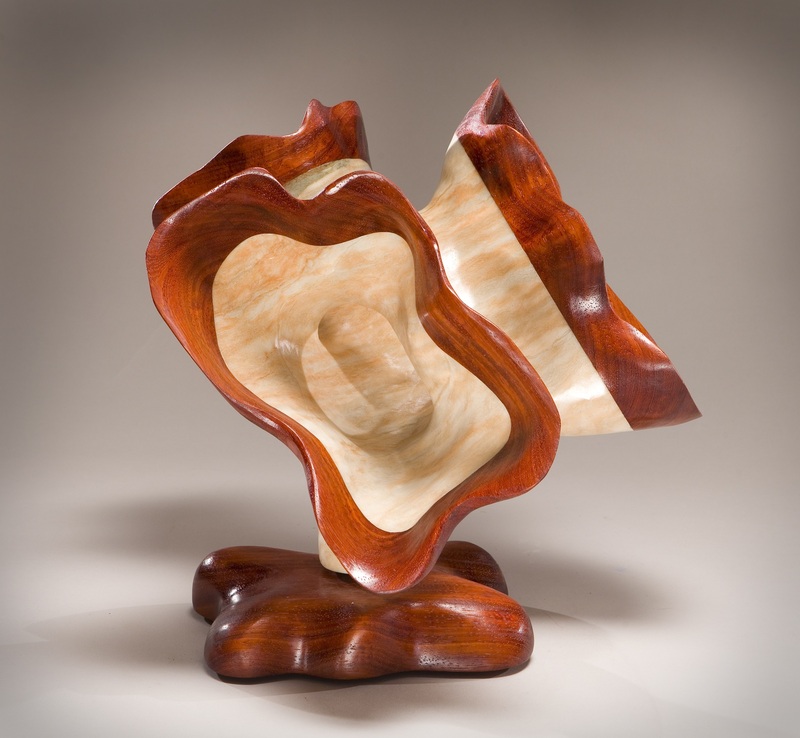 Finally got a picture of this gorgeous Shangrila II rocker made from Bubinga. Photographer Brian Leddy took it last year while doing a photo shoot for NM Magazine. 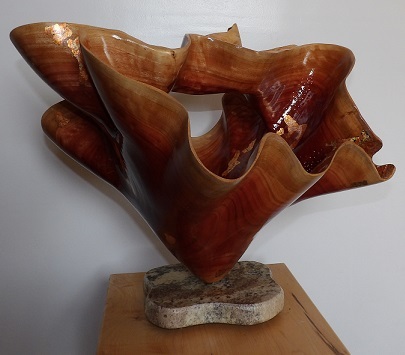 He traveled down to our place and took photos of several different pieces. But this is the one I really wanted. We never had photos taken of this beauty before it sold. It sure looks good with the NM landscape in the background. 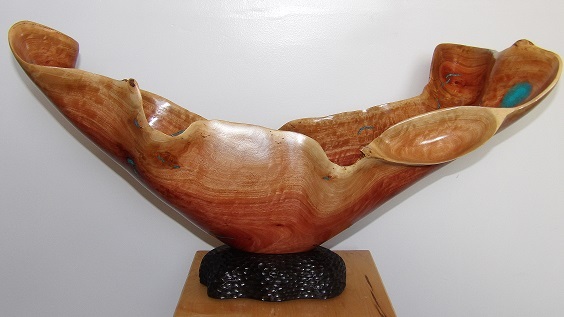 The Bubinga wood is one of my favorites because of how beautiful the grain is. 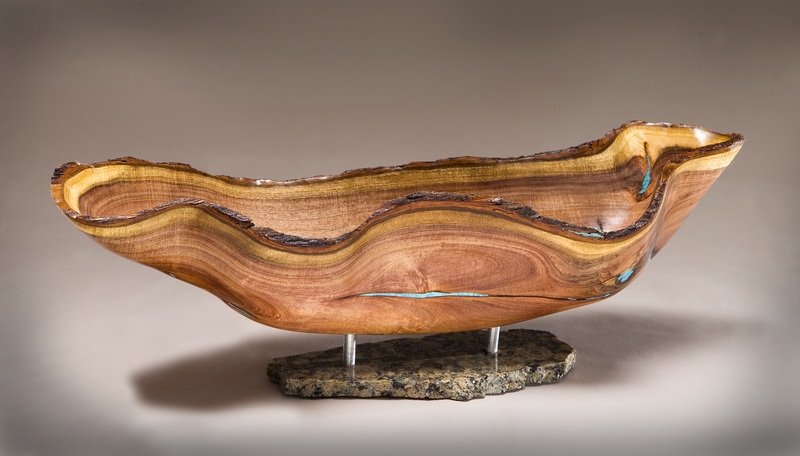 And using it on this rocker makes it a real stand out. 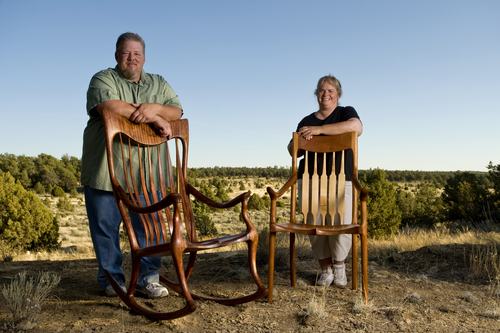 This is another photo Brian took of Scott and I with the Bubinga rocker and one of our dinning chair prototypes. I really like how it turned out. The backdrop is so pretty with the trees in the distance. We get to look at this beautiful view every day. Here are some of our most recent projects that we just completed for our show this week in CA. 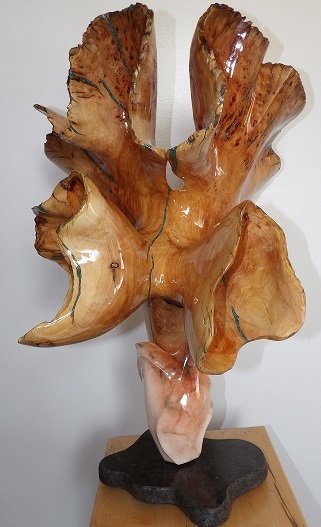 Here are a few of our newest sculpture pieces. Some will show up again in a later post after the Professional photos are done. But for now this is a quick over view of some. 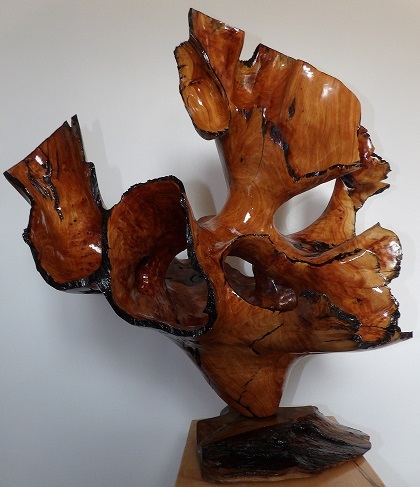 This Ironwood has turned out to be an incredible wood to work with. It has so much beautiful grain and color contrast. 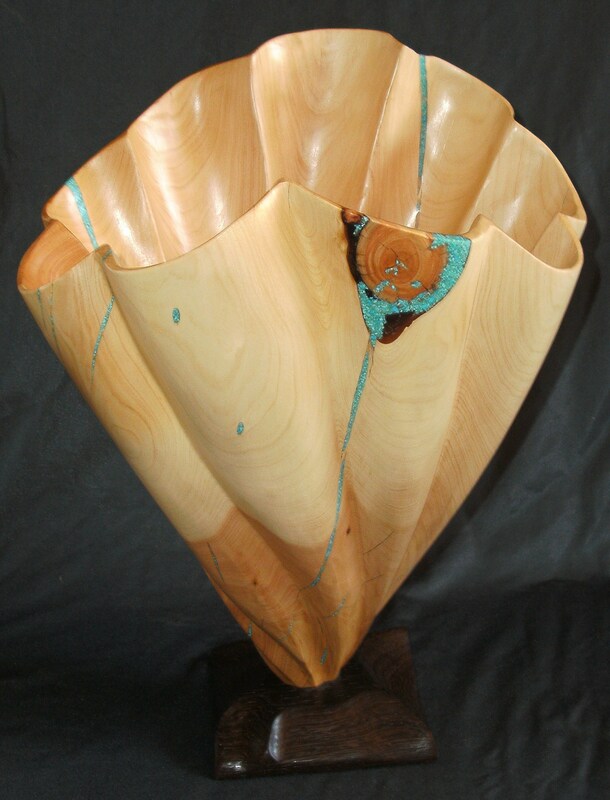 We don’t have much left, but Scott was able to squeeze out making this oblong heart shaped piece. 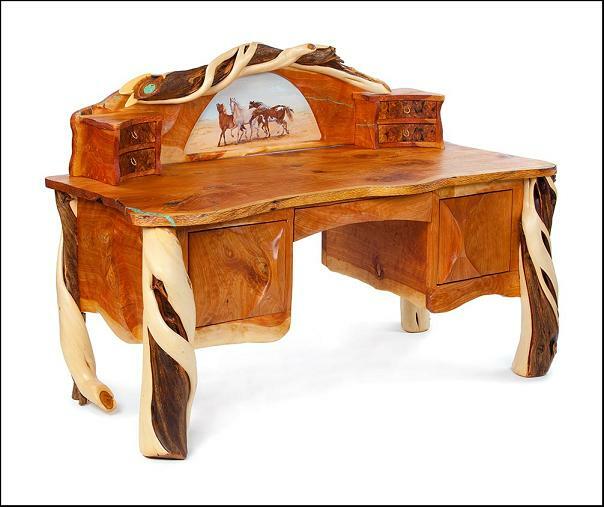 This desk was part of our “One of a Kind” theme desks. 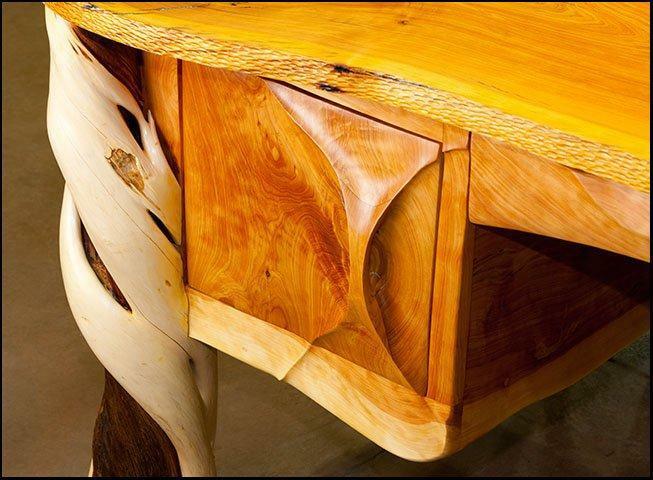 Made from “Forest Reclaimed” Juniper it features hand carving throughout the desk. 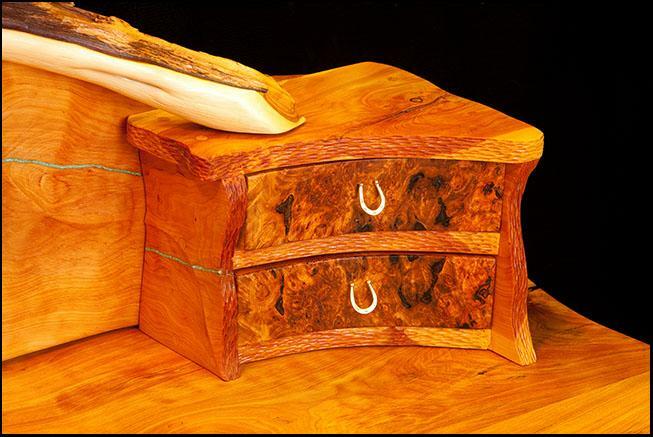 Those being, the door handles, drawer face, desk sides, top drawer sides and on both sides of the painting. 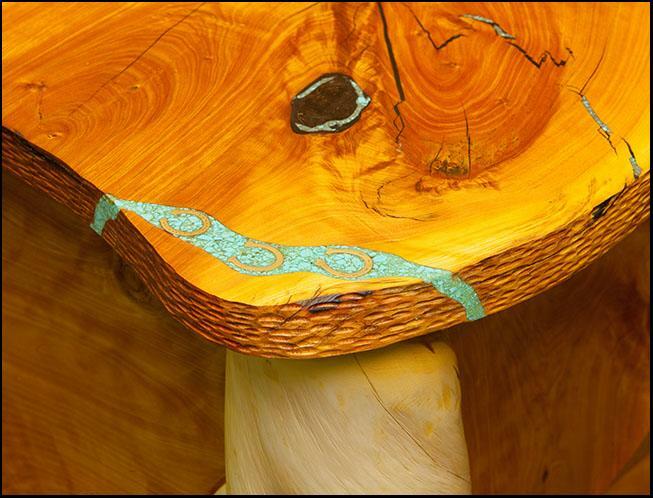 stippling was created on all the edges and turquoise was inlayed into the natural cracks. 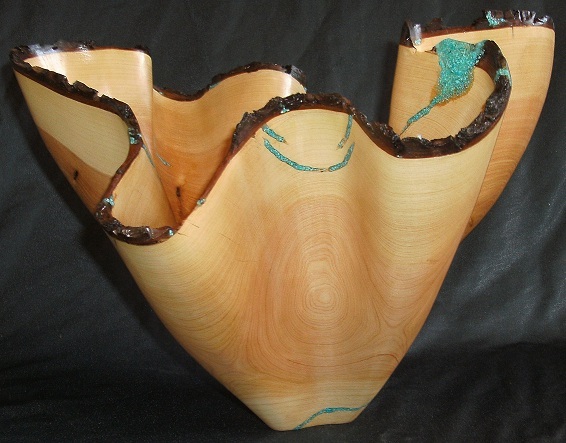 We even created a river of Turquoise on the edge of one side, that has some horseshoes inlayed in it (see inset above). 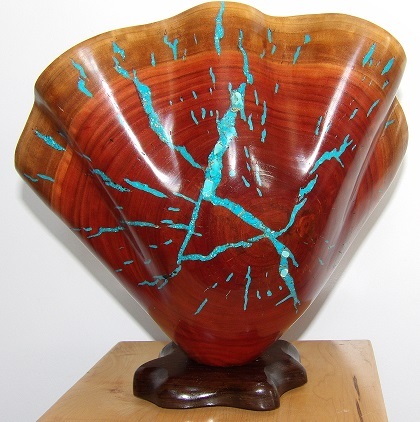 This piece was a collaboration between ourselves and two other New Mexico Artists. 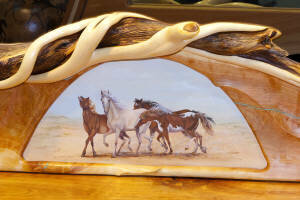 The original oil painting of the wild horses was created by Victoria Mauldin from Ruidoso NM and the handforged brass horseshoe pulls and inlays were handmade by Donna Spray from Alto, NM. 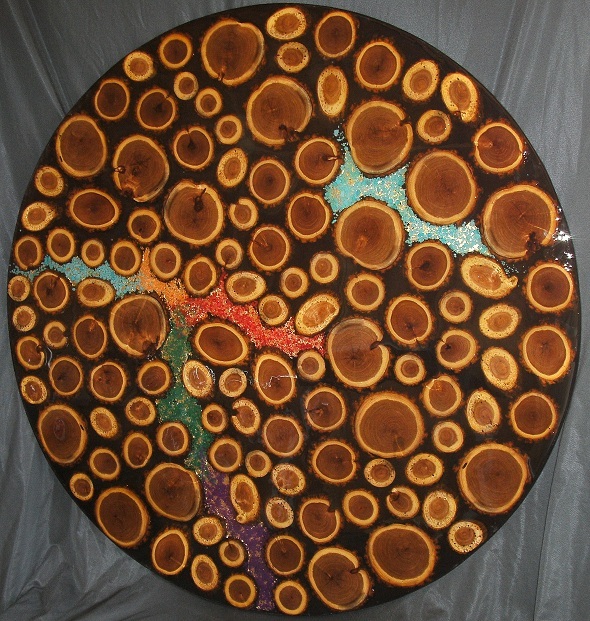 The collaboration makes this piece not only one of a kind, but adds to the overall unique character of it. The desk also includes a low back desk chair (picture coming soon). 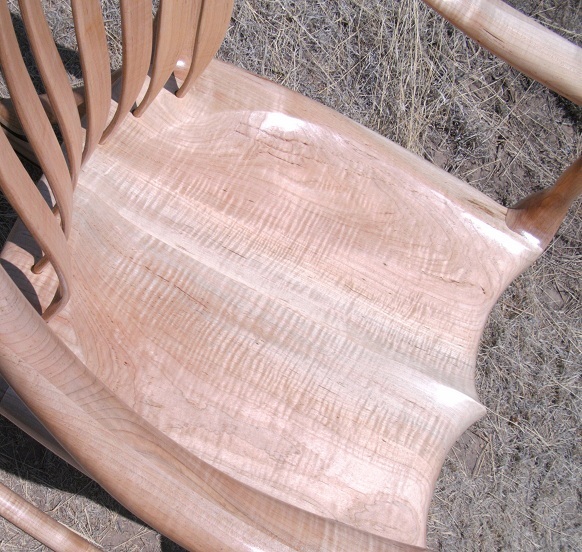 The chair has all the features of our low back chairs with the carved seat and hand shaped arms and backrest. 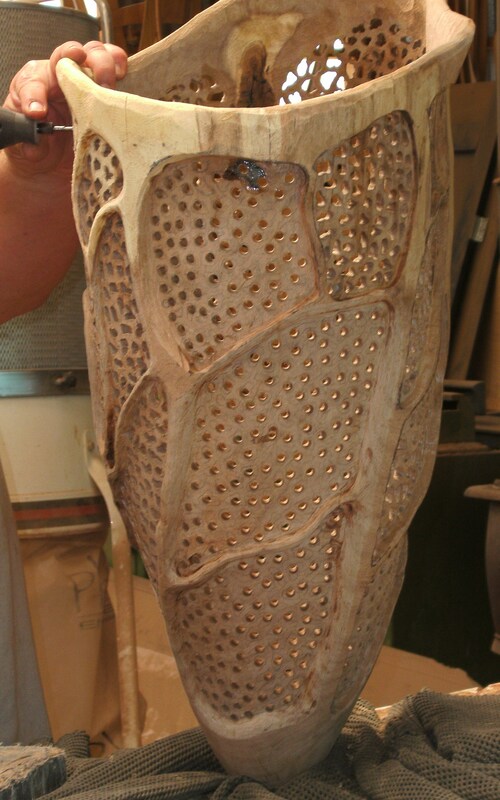 The wheel base adjusts up and down, tilts and swivels and we disquised the metal with hand shaped wood. 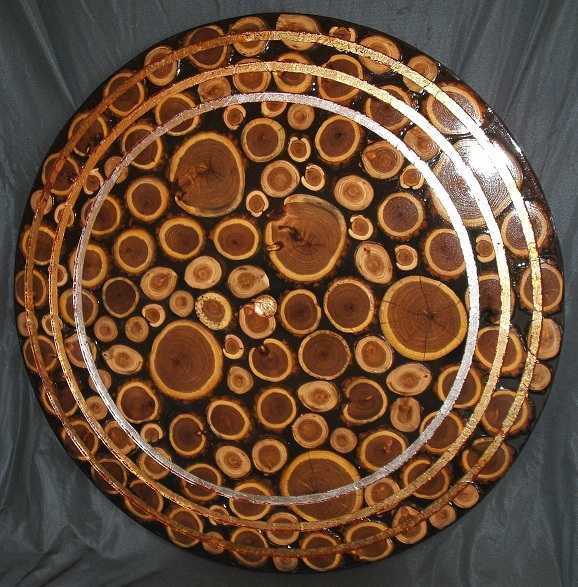 The idea behind doing these theme desks, is to have “One of a Kind” pieces for those discriminating individuals to show off in their home or office. 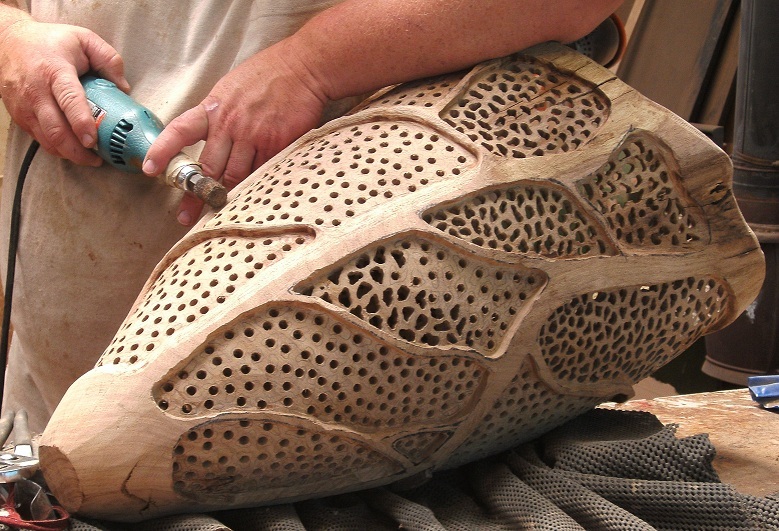 We strive to ensure that each creation has unique qualities, special features such as the carving, and to collaborate with other artists. Thus far we have had three different themes (please visit our desk page on our website to see the others), but the ideas are limitless. You are currently browsing the archives for the New Photos category.